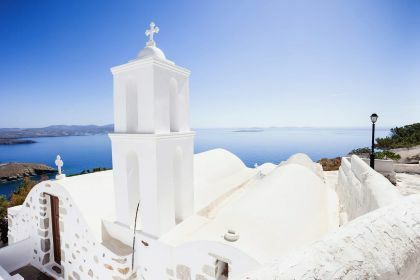 Call or contact your friendly Abberley charter broker here for assistance in planning an unforgettable yachting vacation in Astypalea and the Cyclades. Whether you drop anchor for an extended period in the main harbour at Skala harbour or moor off the beaches of Livadia and Maltezana, yachting around this quiet, picturesque island will be an exclusive, memorable experience. 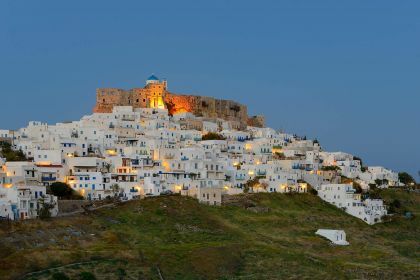 As your yacht approaches Astypalea, you will be rewarded with the sight of windmills and a medieval Venetian castle standing sentry over the main village, and the scent of oregano and thyme drifting in the air. 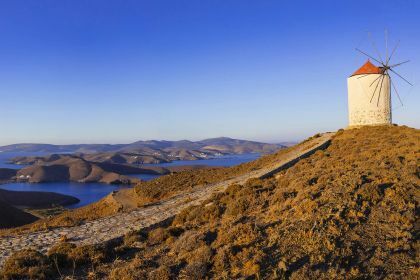 Because Astypalea is remote with low-key infrastructure, being aboard a yacht makes discovering the island’s secret delights that much easier. Instead of having to drive along bumpy dirt roads to reach the beaches of Vatses, Kaminakia and Chrisi Ammos, you will moor offshore and spend the day diving into the brilliant blue sea. The imposing Venetian castle Querini in the main town sits like a crown atop the hill, its black stone contrasting with the white-walled houses clustered around it. Wander through its ancient rooms, stopping for the breathtaking views of the island and sea, making sure to browse the souvenir shop on the way out. Like the island itself, the fare on offer is earthy, unique and fragrant. Sample jam made from crushed rose petals, artisanal fennel bread and a mild local cheese called chlori. For more substantial delicacies, try rabbit in tomato sauce, courgette balls and aubergine salad. Astifagia, overlooking the beach at Maltezana, serves delicious seafood and is known for its lobster spaghetti. Each meal at Agoni Grammi, in Chora, is preceded by freshly made bread with dips, and the restaurant is popular for its seafood, lamb, goat and pasta. The prawn and seafood spaghetti dish with fresh tomato and saffron sauce is not to be missed. Astropelos, in the village of Livadi, offers contemporary Greek cuisine, such as fish carpaccio with herbs and calamari stuffed with mint, tomatoes and cheese. Mouggou Café, next to the historic windmills in old town, is a fantastic place for a sundowner, offering spectacular views of the harbour. Sip a glass of their famous honey raki on the terrace bar and watch the sun set. If you get the urge to dance, Kouros Bar and Club – with its funky lighting and relaxed atmosphere – is the perfect place to let down your hair. Stop for a cocktail at Mojito Vibe in Livadi, a laidback beach bar with tables under thatched umbrellas. 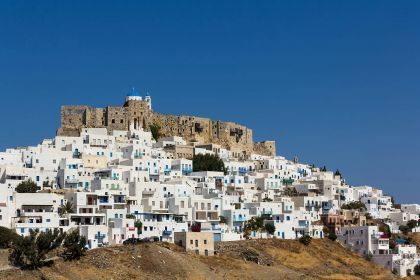 Want to discover the hidden gem of Astypalea? Contact Abberley charter brokers here or by phone and we’ll help you fulfil your dreams. Insider tip: Foraging for herbs and plants is a big part of this island’s cuisine. Join a foraging hike into the mountains near Livida – inquire at Astropelos restaurant.